Healing Power of Pets – Pets On Wheels of Scottsdale, Inc. Many researchers are finding that the most serious disease for older persons is not cancer or heart disease — it’s loneliness. It may sound more like a poetic image than an overwhelming medical reality, but people die of broken hearts. Love is the most important health tonic we have and pets are one of nature’s best sources of love. Dogs and cats help everyone overcome the pain of loneliness by supplying companionship and affection. For anyone who is consistently left alone pets can also supply a sense of security and protection. Pets can make you laugh and divert your mind away from troubles. They also broaden your circle of friends and encourage good health through exercise. Studies show that pets can aid relaxation, lower one’s blood pressure, promote health, and prolong life. They help us unwind. Nurtured by the affectionate attention of pets, stress and anxiety are eased. Anyone who ever bonded with one will confirm the value of a pet. Many of your medical providers know that if you suffer from heart disease or stress, a cuddle a day may keep the doctor away. But if hugs are hard to come by, the next best thing may be a dog or a cat in the lap. Many elderly and lonely individuals have discovered that pets satisfy their needs and enable them to hold on to the world of reality, of care, of human toil and sacrifice, and of intense emotional relationships. Their self-concept as worthwhile individuals is restored and even enhanced when they find that the pet they have been caring for loves them in return. According to a study in the International Journal of Aging and Human Development, many elderly Americans think having a pet is more important than moving to a convenient place to live where pets aren’t allowed. Unfortunately, some elderly, who live in a federally assisted facility, are unaware that it’s against the law to discriminate against pet owners. The good news is that tolerance for pets in elderly housing facilities is increasing and all states now allow pets in nursing homes. Patients in hospitals or nursing homes who have regular visits from their pets are shown to be more receptive to treatment. Their pets bring love and acceptance that boosts self-esteem and helps give the patients the incentive to recover and the will to live. 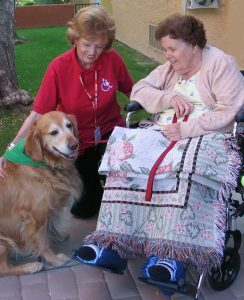 Animal programs in nursing homes increased self-care activity and mobility; residents “came alive,” their spirits lifted. Depressed patients who were unwilling to work to regain lost skills resulting from a stroke — when given a pet to play with – began to smile and cooperate with therapists. Those who have Alzheimer’s disease may experience loneliness and emotional isolation. A pet is always there, eager to please, no matter what the person’s state. Some pet programs at nursing homes are credited with enabling patients to reach out beyond their own pain and isolation and start caring about the world around them once again. A lot of these patients have many losses, personal as well as some physical health problems. It’s important for them to have something like a puppy that’s so accepting, that doesn’t care if you are in a wheelchair or if you can’t walk, or if you’ve had an amputation. [Ann Barker’s Burt is shown going for a ride. Burt loved everybody and it meant a lot to the patients. Many studies also show that pets are psychologically important to the elderly, as they help stimulate socialization by providing a topic of conversation with others where stories of happy moments with pets are shared. When people talk to people, blood pressure tends to go up because we always wonder how the other person’s evaluating us. With pets, it’s really quite different. For an older person, whose wife or husband has died, a pet may be the only being that they can touch and cuddle and talk to, giving them that kind of feeling of intimacy which is so important for human existence. A pet can help us cope not only with the loss of a loved one but helps us adapt to changing circumstances such as an illness or a change in living arrangements.